Staff Member Mac playing with the lab’s new Oculus Rift VR headset. 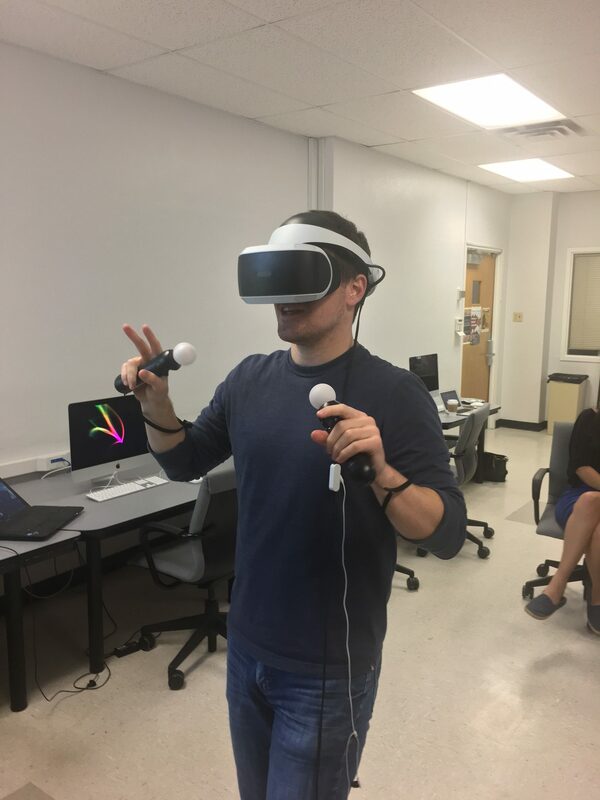 Staffer JB plays with the Oculus Rift in Parlin 104.
has obtained an Oculus Rift VR headset for the Playstation 4, which allows immersive gaming experiences in full, 360 degree virtual reality. The staffers assigned to wearable research have been playing with the Oculus in an effort to develop lesson plans that put students in virtual environments. The pedagogical opportunities offered from engagement with virtual reality rest upon the capacity for this technology to disembody a subject and renegotiate their sensory engagements, to re-articulate gestures and movement within the virtual environment. Rhetorically, the virtual reality headset can be analogized to represent the inherently perspectival dimensions of our own subjectivities: our actions, movements and gestures take meaning from our own perspective, we assign them meaning through recourse to our own understanding. Watching someone swing and point at what appears to be nothing, while they are in fact being bombarded with sensory stimuli, is a subtly accurate metaphor for how we are at once together and individuated as subjects, developing our own internal myths and narrations of ourselves and our actions. DWRL staff has also been experimenting with physical computing devices, tinkering with and building rudimentary devices that employ arduino logic programmers and breadboards. These experiments were spurred on by UT’s own Professor Casey Boyle, who collaborated with the DWRL to get the students in his graduate seminar focusing on access, disability, and the relationship between bodies and technologies, to engage and tinker with physical computing devices. The device in the above gif detects presence through an ultrasonic sensor, and responds to proximity with a variable audio pitch and a led light graph. Experimentation like this not only teaches valuable lessons about the material structuring of the technologies that surround us, but also articulates the interventions that technology makes upon our mental and physical experiences, and calls into question our narrations of assistive technology, and how the rhetoric we employ in distancing ourselves from machines has ethical implications relating to the study of disability and accessibility. 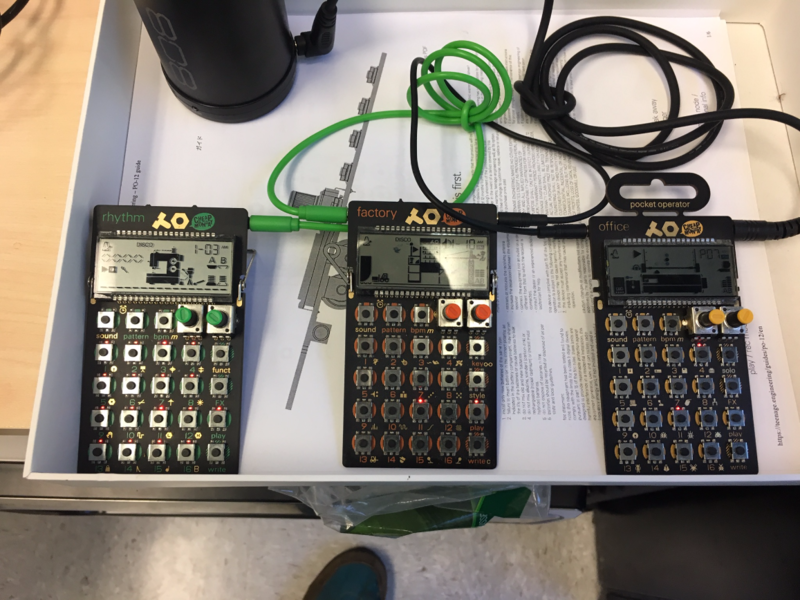 Following the impetus of the DWRL, I have recently set up a micro-music production station, using three “pocket operators”, calculator sized electronic instruments that nonetheless offer the full functionality found in much larger pieces of equipment. This “micro-production studio” has a drum machine (the green “rhythm”), a lead synthesizer (the orange “factory”) and a “noise synthesizer” that emulates the sounds of an office from the 1980s (the yellow “office”). All three units have sixteen parameter controllable sounds, sixteen effects, and can be programmed per step in a sixteen step sequence, or played live “in real time”. The three units are synced together, and will start and stop at the same time, making it simple to tinker and play with the units. This “micro production studio” in Parlin 104 is open to any staff or student taking class in a DWRL classroom, offering an opportunity to experience the methodology behind making music with machines, and how this differs from what is typically understood as “performing music”. Experimenting with technology and engaging it materially, aside from being downright fun, offers a host of pedagogical opportunities, from theoretical insight into our techno-culture, to practical knowledge of complexity of the machines that surround us. The DWRL strives to provide students and faculty with access to spaces and devices for productive engagements with technology. This semester has brought new and unique opportunities for instructors to use technologies in their classes, in the hope that these opportunities will translate to generative student-experiences that encourage students to tinker with and think about technology in its many forms. As a lab, we hope to see students and instructors use our resources in fun and productive ways. Students in DWRL classes, and faculty are encouraged to come by Parlin 104, to try to make a beat, or enter a virtual world. And instructors interested in engaging technology in the classroom should come by Parlin 8B during the week for mentoring hours, to develop a lesson plan, execute an in-class activity, or set up a workshop for using technology in the classroom. The mentoring office is staffed Monday-Thursday, from 9-3. We hope to see instructors actively pursuing unique and generative pedagogy that brings technology into the classroom, and encourage instructors to stop in and chat with our staff, or tinker with technologies such as those mentioned in this post.